What interesting news! I was surprised when BF opted for a second. Now a third! I think the reason they haven't mentioned deployment is because they are still waiting to see how the Cork-Roscoff/Santander operation does in the next couple of years, as it has only been running a year after all. Perhaps they'll have this third vessel on UK-Spain with Galicia transferred after two years to the Irish operations - as Galicia won't be LNG. With this development, I think they will sell Cap Finistere. Although the Le Havre suggestion does seem a good idea! Well, the Cap doesn't look bad at all. The addition of blue to the funnel and stern look good. At this stage, the order of how well the livery fits with the design from best to worst in my opinion goes: Armorique, Normandie, Cap, Pont-Aven, Bretagne. Blue striping always previously tended to be applied to the windows of passenger areas, so personally I would have preferred Cap's stripe to be one deck lower, but hey ho. Finally, anyone else find it unusual that they painted the bridge white on Cap but kept it blue on Normandie? I have the same problem as Khaines. I haven't voted but it doesn't let me vote. What Khaines sees is all I can see. Thanks. Didn't know they published the cabin quantities for Honfleur! On the new site, I can't seem to find the page showing a comparison of facilities across ships and quantity of each cabin type per ship. Of course, this is trivial information, which I'm guessing was deemed unnecessary and/or the page on the old site was used by few customers. Surprisingly, Normandie doesn't look too bad! Of course, I liked the original scheme she had worn since she was built, but unlike Bretagne's new design, this works well. I'd say Armorique and Normandie have come out best so far. I'm guessing Cap Finistere will follow suit, and lose one deck stripe. The scheme seems to include striping around the bow and stern so I'm guessing that too. I really don't understand what's wrong with the self-service restaurant. In my eyes, it caters for more tastes, (i.e. the average family) at a reasonable price and I almost always enjoy my meal. Does the average person really choose Pont-Aven over Armorique due to too much plastic?!? Certainly wouldn't influence my decision. 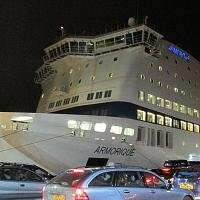 Also, I'd like to mention that all ships bar NEX, Pont-Aven and Bretagne have open deck parking. Overall, despite the fact they are very different, I like both Armorique and Bretagne a lot. I would happily choose to sail on both of them. But maybe I just enjoy travelling on ferries in general? At least the new Le Havre timetable only affects two sailings in each direction. (Monday and Saturday overnights outbound, and Monday and Saturdays 17:00 sailings return). As Normandie operates such services to Caen, it should be easy enough for customers to just change their booking to Caen should they want to keep those same timings. Epsilon is branded as an economy service, and was even before Brittany Ferries took on Etretat. So they may have took inspiration from Irish Ferries? On Bretagne, surely it would have made sense to extend the blue line to where the windows end? I know Pont-Aven's blue line stops but Armorique's blue line extends to the end. It's good that the double-deck linkspan can finally be used again, when was the last time it saw regular use?